Why is KAYAK Called KAYAK? These days new startups seem to come a dime a dozen. Despite the multitude of industries, most start the same way. They hatch from a big idea and reach for fast success. Almost as important as the big idea, though, is the name with which it’s presented to the world. Needles to say, there’s a lot that rides on the name of a new company, including customer recognition and recall. Some companies, like Google, Apple and Amazon, have created homonyms and changed the English meaning behind the words. Meanwhile, other less lucky newbies fall into the vast reaches of the spoken word with the likes of “fetch.” So, if a startup by any other name doesn’t, in fact, sound as sweet, how does one choose? Is there a method or just madness? Unfortunately, much like the tech startup world itself, there are no hard and fast rules to picking the perfect brand name. Strategies often vary as much as the founders, and while some almost literally pull a name from a hat, others pay experienced marketing companies to do their dirty work. The latter approach actually happens to be the route KAYAK founders Steve Hafner and Paul English took when they were incubating the travel aggregate site. 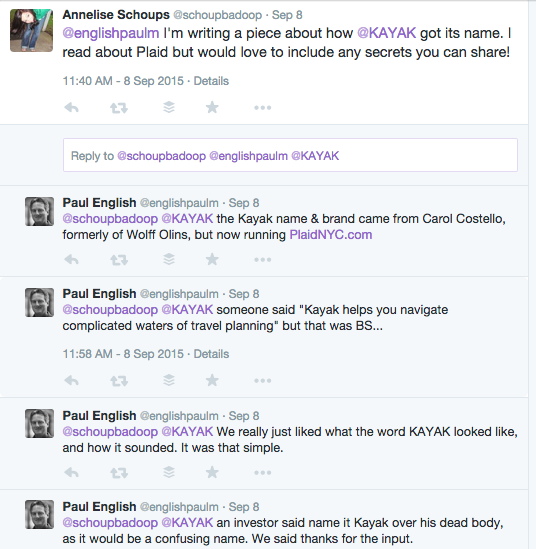 Why is it called KAYAK? The challenge put some wind in their sails and soon, KAYAK took flight. By 2007, the company had raised almost $200 million in funding led by Accel Partners, Sequoia Capital and Oak Investment Partners, and by 2009 it was named one of 50 best websites by TIME Magazine. Shortly after, the company also acquired SideStep, Swoodoo Brand and several shares of CheckFelix, all of which were competing travel sites, in order to grow its capabilities. SEE ALSO: Why is Expedia Called Expedia? 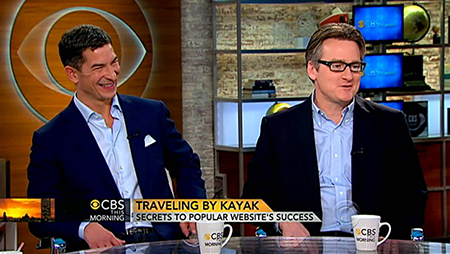 Eight years after launching, KAYAK finally went public in July of 2012, only to be purchased by The Priceline Group for $1.8 billion in November of the same year. Today it’s one of the top travel sites for comparing prices, acting as a metasearch for flights, hotels, cruises and rental cars in one, convenient place. The about page boasts service in 30 countries, 18 languages, and 40 million mobile app users. And on July 22nd, 2015, they announced their integration with the new Apple Watch. There’s no doubt that KAYAK is still helping millions of users navigate their own travel plans on a daily basis, even if that line was B.S.